Today, Congressional Western Caucus Chairman Paul A. Gosar D.D.S. (AZ-04), House Committee on Science, Space and Technology Chairman Lamar Smith (TX-21), Western Caucus Members Doug Lamborn (CO-05) and Bob Gibbs (OH-07), representatives for the Competitive Enterprise Institute, the National Mining Association, Americans for Limited Government, the American Resources Policy Network, the Yavapai Cattle Growers Association as well as the Apache County Supervisor Doyel Shamley released statements after the Caucus led a coalition of 18 Members of Congress and dozens of stakeholders requesting that EPA Administrator Scott Pruitt reverse a preemptive veto of the Pebble Mine project in Alaska. Chairman Paul Gosar stated, "Administrator Pruitt knows what we think of his accomplishments in office, but we'll say it again: they're outstanding. The EPA under President Obama turned into an extra-constitutional legislator in its own right, issuing vast national edicts without statutory authority and requiring total compliance. When the Trump Administration and Administrator Pruitt came in, all that changed, and we have since seen the EPA bring its activity back within statutory boundaries in order to protect the environment through the use of science-based policies. The preemptive veto of the Pebble project in Alaska - a holdover of the Obama EPA - is the one glaring blemish staining Administrator Pruitt's record. This kind of power-grab has no place surviving into a Republican administration - not least because we know future Administrations would be glad to abuse such power in even more severe ways. Today, we've made a clear case for why allowing this unprecedented veto to go forward is an affront to due process, to stable capital markets and to the priorities of the Trump Administration. This is about process, not any particular project. Administrator Pruitt, projects shouldn't be vetoed before they have even been proposed. The Obama preemptive veto has to go." House Science Committee Chairman Smith said, "Our government is based on the principles of due process and the rule of law. EPA’s preemptive veto of the Pebble Mine in 2014 undermined both. The EPA, under new leadership and with a fresh perspective, has an opportunity to reverse the misguided decision and let the rigorous permitting process work. I strongly urge Administrator Pruitt to withdraw the proposed determination." “Industries in the United States should be able to rely on a transparent, reliable regulatory and permit approval process to operate. EPA and other agencies must not have the ability to deny American companies administrative due process with preemptive veto authority. Allowing regulatory entities to tell a business not to even bother applying for a permit, before any scientific analysis can be completed, will have a chilling and dangerous effect on American entrepreneurship and stifle economic growth. That’s why I introduced the Regulatory Certainty Act to prevent the EPA from filing preemptive vetoes under Section 404 of the Clean Water Act. I join my colleagues in urging the EPA to reverse course and prevent setting a precedent that could do terrible damage to the American economy," said Congressman Gibbs. Congressman Lamborn stated, "Considering the fact that the United States is increasingly reliant on foreign sources of critical and strategic minerals, it would be detrimental to our nation’s national and economic security to preemptively veto one of the largest undeveloped deposits of copper and gold resources in the world. Administrator Pruitt should withdraw the preemptive veto and allow the Environmental Impact Statement to proceed in order to restore due process, fairness, and regulatory stability surrounding mining projects in our nation." Myron Ebell, Director for the Center for Energy and Environment at the Competitive Enterprise Institute stated, "The pre-emptive veto of the Pebble mine and of all other potential mining projects in the Bristol Bay watershed should be withdrawn immediately. It conflicts with the Trump administration’s proposal to eliminate EPA’s veto authority under section 404c of the Clean Water Act entirely, and it sets a dangerous precedent. If one huge area of the country can be closed to natural resource development, what is to stop a future administration from arbitrarily closing off other areas—for example, the Mississippi River watershed?" "There is no excuse for continuing this Obama administration dramatic expansion of power that threatens all resource development activity in future administrations. You can agree or disagree about the wisdom of the Pebble Mine development but those decisions should be reserved to the NPRM process and not preempted by shoddy political science that overrides the legally established approval process," said Rick Manning, President of Americans for Limited Government. "This administration has been a leader in showing that the responsible development of our natural resources and environmental stewardship can coexist,” said Hal Quinn, President and CEO of the National Mining Association. "Given the Pebble Mine Project’s potential as one of the largest deposits of copper and gold in the world, our hope is that the EPA will withdraw the prior administration’s preemptive, uninformed and improper veto of the project, allowing the project proposal to proceed through the appropriate review channels as intended under the National Environmental Policy Act." "With the growing recognition that the U.S. is dangerously dependent on foreign supply for scores of critical minerals and metals, the need for a predictable permitting process has never been greater,” said Daniel McGroarty of the American Resources Policy Network. 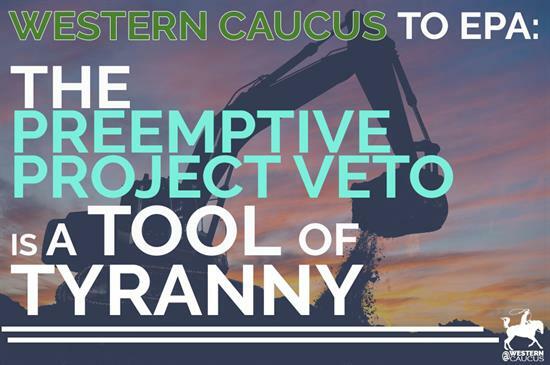 “The pre-emptive veto of the Pebble Project casts a chilling effect over resource development in the U.S. As the letter says, to allow a pre-emptive veto to stand is ‘contrary to the spirit of our environmental protection laws, to due process, and to basic fairness." "For EPA not to allow due process flies in the face of our country's most important institutional principles. While the old saw of the squeaky wheel gets the most grease, we need to use the environmental and scientific studies that are mandated for environmental issues," said Larry Parker, President of the Yavapai Cattle Growers Association. "We can no longer tolerate the damages done by bureaucrats who seek to rule our country via administrative fiat, undermining scientific based due process and the rule of law," said Doyel Shamley, Apache County Supervisor. Today, May 3, 2018, the Western Caucus led 18 Members of Congress and dozens of stakeholders in sending a letter addressed to EPA Administrator Scott Pruitt respectfully requesting he proceed with his original statements and intention to withdraw the Obama Administration EPA's preemptive veto of the Pebble Limited Partnership mining project under Section 404(c) of the Clean Water Act. Read the letter with all signers HERE. Be sure to also check out the Wall Street Journal Editorial Board's excellent piece concerning the precedent concerns arising from retaining the preemptive veto. In particular, the letter responds to the EPA’s decision to abruptly change course and opt not to withdraw the Obama Administration’s preemptive veto of the project, contrary to Administrator Pruitt’s prior stated commitment to do so. The preemptive veto, initiated under Section 404(c) of the Clean Water Act, acts as an EPA “failsafe” set outside of the normal Army Corps of Engineers-facilitated NEPA process, along with its requirement of an Environmental Impact Statement (EIS). This, despite that the NEPA EIS takes a full environmental, ecological and chemical inventory of the scope and likely effects of a project as proposed. NEPA EIS’s are rigorous and comprehensive, and the eventual EIS for Pebble Mine will be able to accurately determine whether it poses adverse risks to the environment and habitat of Bristol Bay or not. Rather than allow the EIS to proceed as normal for Pebble Mine, the EPA’s actions set a damaging precedent wherein projects that have not enjoyed the scientific and other study required by law can be preempted and shut down by EPA. These actions are contrary to the spirit of our environmental protection laws, to due process, and to basic fairness. For example, in the five trading days following the recent EPA decision, Pebble’s parent company Northern Dynasty Minerals saw its stock fall 40%. This is the predictable market reaction to the EPA's unpredictability, which will wreak havoc in mining-related capital markets if regulatory certainty is not restored. As such, the letter requests that Administrator Pruitt opt to scrap the preemptive veto in order to restore due process, fairness and regulatory stability surrounding all mining projects, prospective or proposed, in the United States. This issue only grows in importance in light of President Trump and Department of Interior Secretary Ryan Zinke having made clear our overriding need to reduce reliance of foreign importation of critical and strategic minerals as matters of national and economic security. At a time when domestic mining is critically important, providing regulatory certainty by following established processes is of utmost concern.